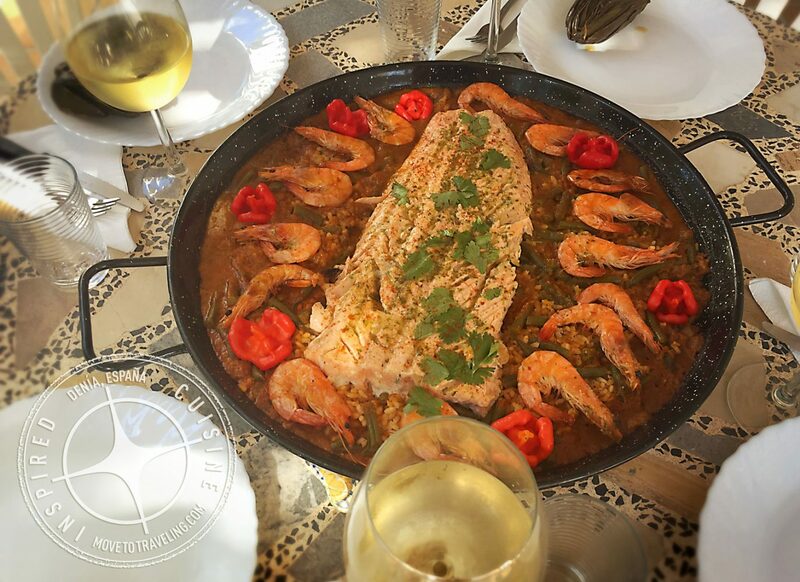 Our Arroz de Viernes recipe for Seafood Paella is a delicious, creation of love. Why? It was inspired by, and enjoyed with, fellow travel and food bloggers, Eulanda and Omo of award-winning travel blog, Hey! Dip Your Toes In. We think that wherever you are, you can enjoy this recipe too and bring a taste of Spain into your kitchen and home to share with your friends. Learn what inspired this creative take on paella and enjoy a printable version of the recipe below. Jump ahead to our recipe card and print for free. Seafood Paella and Jamie Oliver? I saw the post by Jamie Oliver and how his recipe for Spanish Paella got lambasted for using chorizo. So my recipe, if it circulates far and wide in España, might get the same response. Not that I have Mr. Oliver’s bandwidth as a chef, but some people that I have met in Spain take their paella very seriously. No – I mean they are serious paella freaks! “If you haven’t tried my paella, you haven’t had paella…” is usually how it goes. I even did a video on a paella master and the philosophy behind it. It was so incredibly delicious! His family recipe, based on the traditional Paella Valenciana, called for conejo de campo, or country rabbit. Well, this rabbit must have been wild, because he ran around in my system for a whole three days. Perhaps that’s what I get for eating the organs! Like I said, incredible. 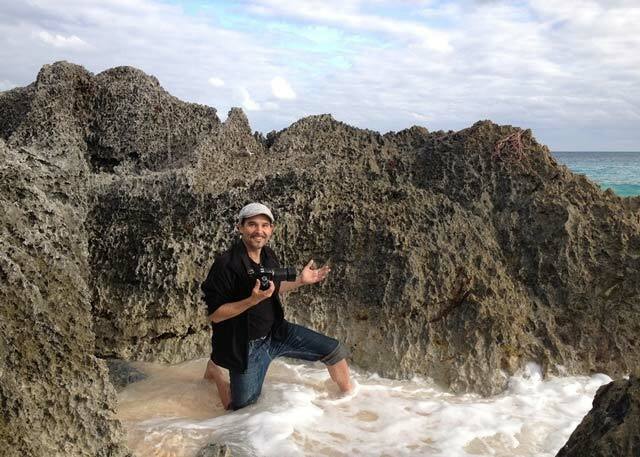 Watch our video ‘A Little Time with Joaquin and His Valencian Paella’. 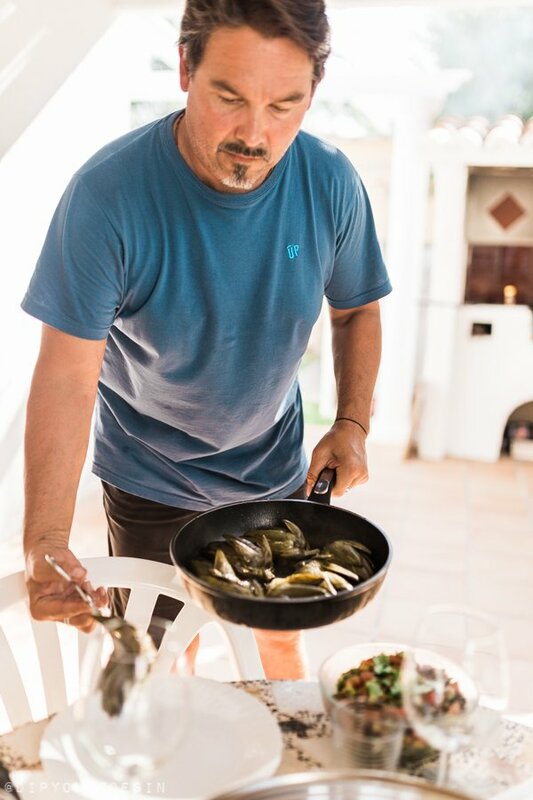 Now at our new home in Denia, we’re creating even more paella experiences. We recently had the pleasure of hosting good friends Eulanda and Omo, who are also fellow travel and food bloggers. 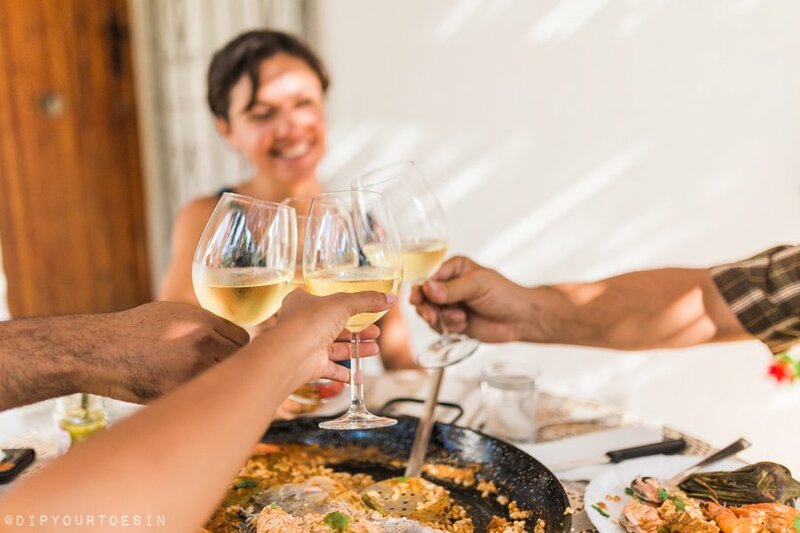 Being the foodies we all are, we of course celebrated the time together with a deliciously fantastic Friday Spanish lunch of seafood paella. And thus this recipe, Arroz de Viernes (Rice of Fridays) was born. Then we ate it! Good times and great friends like these, are what we travel and live for. This recipe was first featured on Hey! Dip Your Toes In. 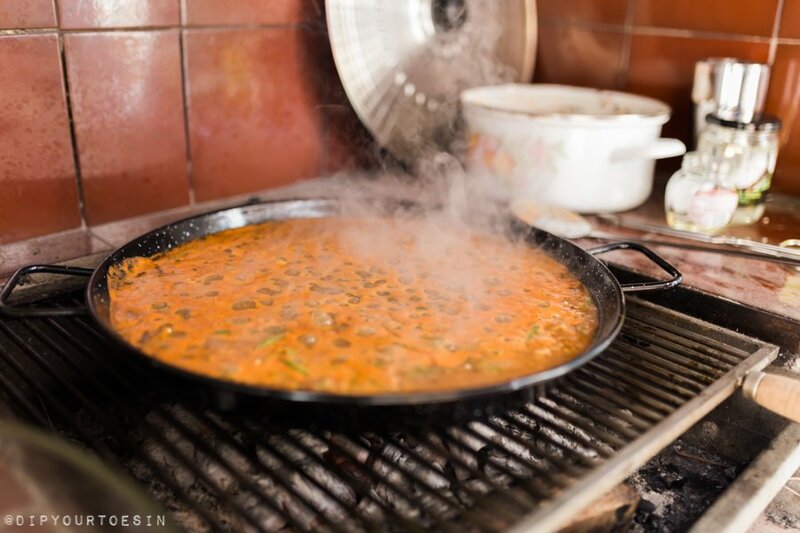 Something to keep in mind – the word paella is actually the type of pan used – not the actual dish. So at least there I’m off the hook because this is an arroz dish – rice recipe simmered slow on an outdoor barbecoa de lena (barbecue of wood), but in the afore mentioned pan. The trick is in the timing and controlling the heat. I’m a creative person and usually don’t care what people think about my cooking. The very definition of being a good chef is not taking criticism personally. I’ll usually take criticism with a grain of salt anyway because in our home I’m the one who cooks. She’s the one who eats more! Luckily I have been able to please most people when I do creative cuisine. Try this recipe. And if you like it, most likely your guests will too. It’s one of those dishes that is meant to be shared with more than 2 people. 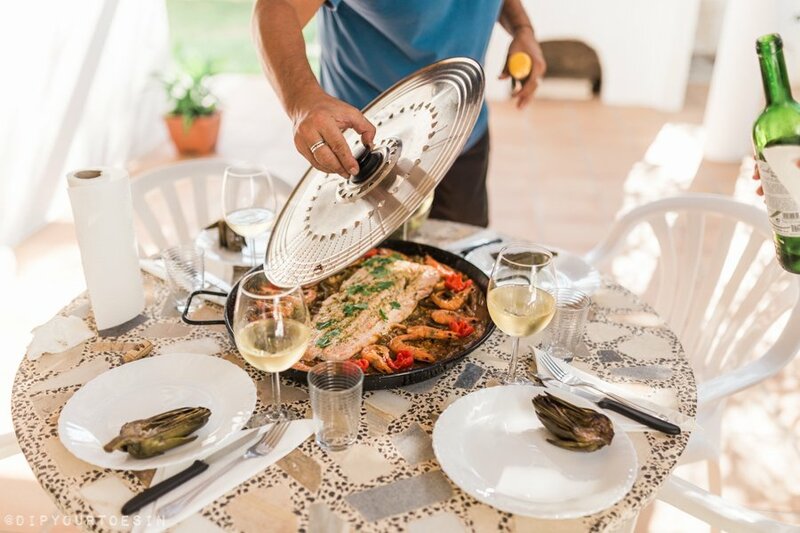 Our recipe for Seafood Paella brings Spain into your home. In collaboration with Hey! Dip Your Toes In, we bring you its story and printable recipe card. Start with the cold cook salmon at least 1 hour in advance to starting the rice. In a glass jar or shaker take the salmon set up and mix/shake vigorously. Spread out half of the mix in a glass dish and briefly place the halved salmon, skin down, then turn over. Cover and set aside. Heat 3 tablespoons olive oil in a paella pan over medium to high heat. Stir in garlic, paprika onions, garlic, and cilantro, and shrimp/clams. Cook, stirring, to coat the seafood with oil, for about 4 minutes. Add in saffron threads, parsley, stock, and juiced lime/lemon with pulp. Bring to a boil. Then, add tomatoes and cook until the mixture caramelizes a bit and the flavors meld. Remove shrimp. Fold in the rice and stir-fry to coat the grains. Gently swirl the pan around (do not stir) so the rice cooks evenly and absorbs the liquid - do this only ONCE. Pour in water and simmer uncovered, and reduce heat to medium low. Simmer 20 minutes. Make sure the paella has a continuous even heat for about 15 minutes. The Spanish touch in technique is to never stir the rice while it's cooking. This can mean a lot of rotating of the pan if you don't have an even heat. That gives us time to grill the salmon! The salmon should have a pale look on the outside of the flesh - a little cold cook. 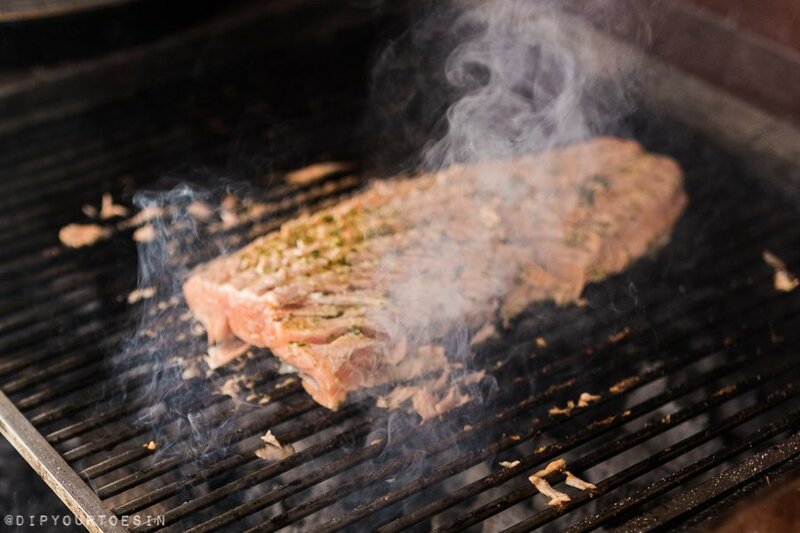 On a medium grill give the salmon a good sear, skin side down. Turn over and let cook until it’s slightly pink on the inside. When it starts to separate, add some of the citrus spice mixture from the cold cook, but make sure to save a little. 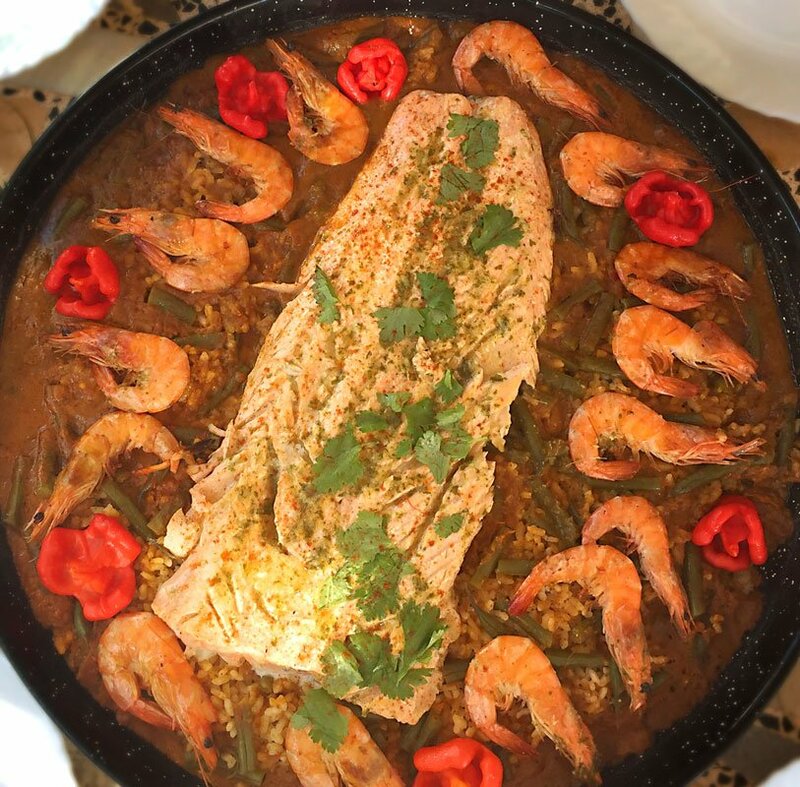 When the rice is filling the paella and most of the liquid is absorbed slide the salmon, with the skin side down, on top then circle the filet with shrimp and peas. Pour the last of the cold cook sauce on the top of the salmon. When the rice is cooked, it should look a little shiny on top. Add the sprigs of rosemary and then turn the heat up for 40 seconds until you can smell slightly toasted rice - then it's perfecto. The ideal paella has a slightly toasted rice bottom called socarrat, or concón in other countries. Remove and let it rest for 5 minutes. Garnish with cilantro and citrus wedges. Serve to good friends and with an Albariño, a lovely Spanish white wine that goes great with this dish. Buen provecho! 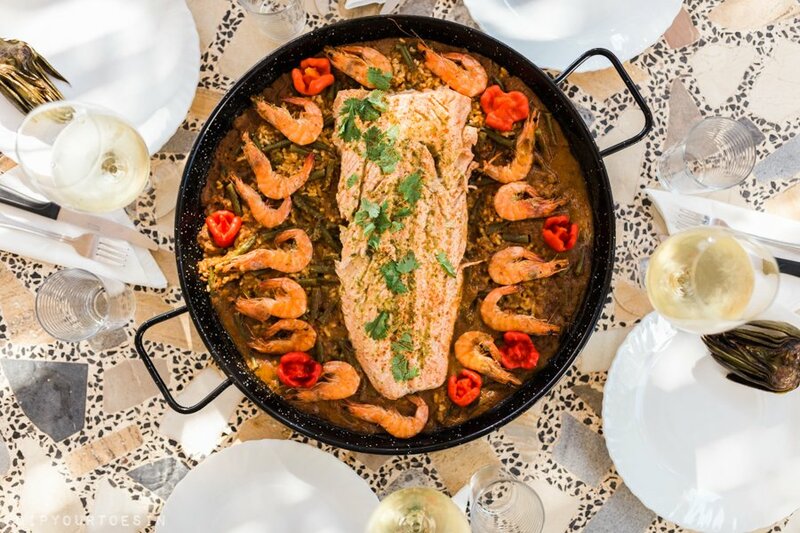 Visit https://www.movetotraveling.com/seafood-paella-salmon-arroz-de-viernes/ for the stories that inspired this recipe.